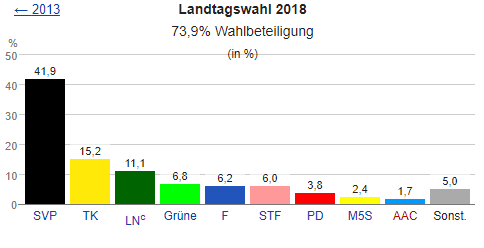 The South Tyrolean state election ended on Sunday 21st of October 2018 with a slightly lower turnout (73.9 percent) than five years ago (77.7 percent). 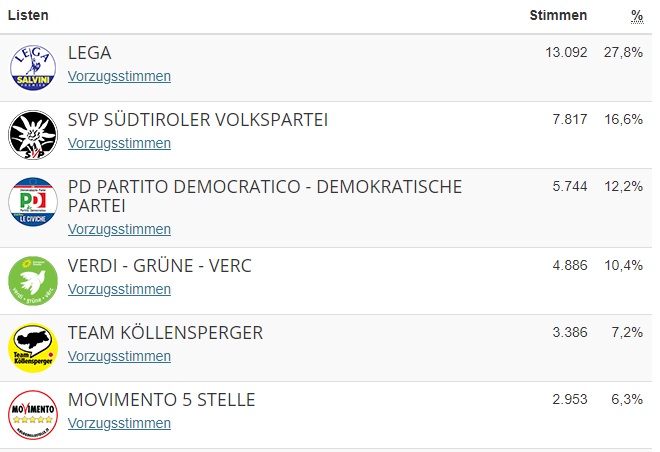 417,968 eligible voters have tuned 35 members in the South Tyrolean state parliament. The South Tyrolean People’s Party (SVP) under Governor Arno Kompatscher has suffered losses. The ruling party since 1948 reached 41.9 percent of the vote, which means a minus of 3.8 percentage points comparing to 2013. Gained in 2013 45.7 percent of the votes and received hence 17 seats, the party will obtain in the future 15 of the 35 seats. The South Tyrolean entrepreneur Paul Köllensperger caused a surprise with his list of the same name, which garnered 15.2 percent of the vote and thus reached second place. 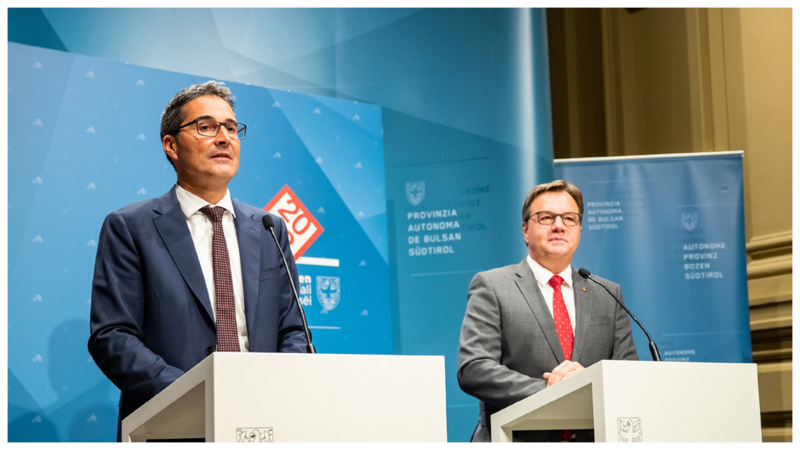 The movement of the former five-star member of the Landtag, which was founded a few months ago, will in future be represented by six mandatories. The right-wing alloy of Interior Minister Matteo Salvini, who landed in third place with 11.1 percent and four mandates, was able to gain ground. The Freedom lost two thirds of the votes. They plunged from 17.9 percent to 6.2 percent, losing nearly two-thirds of their voters. “We will now be in ‘orientation talks’ with other parties and then let the party committees decide with whom there should be concrete negotiations,” said the SVP.